Muzvare Betty Betty Makoni cannot wait to meet this great co- presenter of one of the most amazing radio shows .Please meet the most inspiring woman on radio –Chi-Chi Nnani and read her story on her guest on the show…What do you think ? When I first heard this woman speak, I knew I had ‘hit jackpot’. It was at a Women’s Business Event (IWOP 2014 organised by Vanessa LvLv-Events Wedding-Decor), and she was the Keynote Speaker. She didn’t stay for the entire event. And I am beyond thrilled to say that Muzvare-Princess Betty Makoni Muzvare Betty Makoni will be joining us on the first episode of “Let’s Talk About It”. She’s among other things, a Gender-Based Violence Expert for the UK Foreign Office, CNN Hero, Girl-Child Rights Activist, (widely sought after) Speaker, Author, Mentor, Coach, Human Rights Defender, Educationist, Wife, Mum, and Philanthropist. 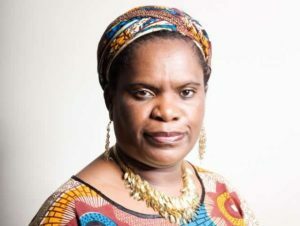 She has also been lauded as “One of the 150 Women Who Shake The World”, and as “the woman challenging UK female genital mutilation”.